Representatives from the Nishkam Centre in Handsworth were among the many voluntary groups to be present at a prestigious event, hosted by Her Majesty the Queen at St James’s Palace. The occasion marked a celebration for the Queen’s Award for Voluntary Services winners from across the UK, Channel Islands and the Isle of Man. The Nishkam Centre was delighted and proud to receive the Queen’s Award for Voluntary Services in 2010 and was humbled to be invited by Her Majesty to a ceremony to celebrate the achievements of all the winners. It was a fantastic occasion for all organisations that had gone above and beyond the call of duty, to meet each other and reflect on their commitments to making Britain better. 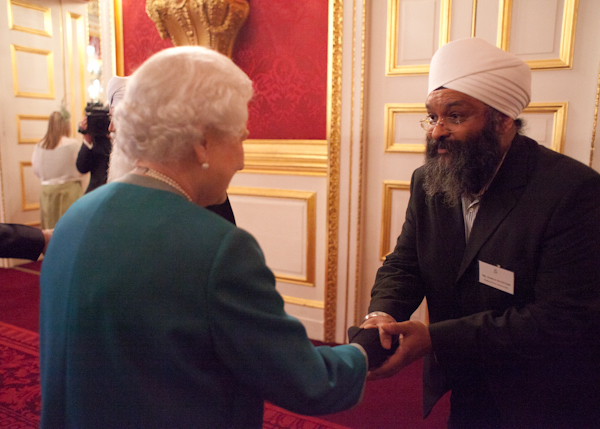 Nishkam Centre Chairman, Bhai Sahib Dr Mohinder Singh and Centre Director, Amrick Singh were pleased to be invited to meet with The Queen and the Duke of Edinburgh at St James’s Palace. Bhai Sahib Ji was no stranger to meeting The Queen, they had met several times on previous occasions including the time of welcoming Pope Benedict with Her Majesty for the Pontiff’s State Visit to the UK in Edinburgh (September, 2010), the Queen’s visit to Darbar Sahib (Golden Temple), Amritsar, India during the re-gilding undertaken by GNNSJ (October, 1997) and the launch of the Queen’s Diamond Jubilee celebration at Lambeth Palace (February, 2012). Many who arrived at the Palace were in awe of the crowds present, the auspicious occasion, the grandiose and meticulous attention to detail and above all the opportunity to meet with Royalty. St. James’s Palace is the senior Palace of the Sovereign, with a long history as a Royal residence. As the home of several members of the Royal Family and their household offices, it is often in use for official functions and is not open to the public. The State Apartments are sometimes used for entertaining during in-coming State Visits, as well as for other ceremonial and formal occasions like this reception. 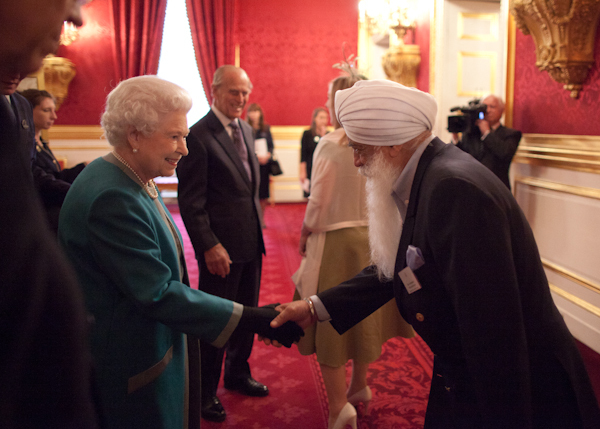 Bhai Sahib commented, “By personally welcoming the guests, The Queen and Duke showed great humility and uplifted people. It was a great gesture that was most appreciated by all.” He also had the opportunity to meet with the Duke and Duchess of Gloucester, the Duke of Kent and prominent members of the Awards Committee. “It was really good to meet Royalty, share with them the fantastic work we are blessed to be involved in and see so many grass-roots organisations that were doing some innovative work with volunteers”. Amrick also reflected, on some of the people they were able to meet who were very interested in the work that Bhai Sahib Ji was leading on. These included Air Marshal Sir David Walker, who spoke fondly about Birmingham. Dr Justin Davis Smith who was an Award Committee member and Executive Director at the National Council of Voluntary Organisations, who was intrigued by the broad scope of the Nishkam activities and said that it was always a pleasure to see so many organisations doing great community work. The Duchess of Gloucester was fascinated to learn that Bhai Sahib Ji had studied at the Duke of Gloucester School in Africa and had fond memories of his time there and that he shared his birthday with the Duke. At this point the Duchess’ Lady in Waiting went and invited the Duke to meet with Bhai Sahib Ji. The Duke of Gloucester discussed the School and faith with Bhai Sahib Ji. It transpired that the school was named after the Duke’s father and Bhai Sahib Ji had his birthday on the same day as the Duke’s father. The Duke was very impressed by the work being undertaken by charities like Nishkam. He went on to comment about Sikhs in Uganda, in particular he mentioned Sikhs being very industrious and hardworking. The Queen’s Lady in Waiting, Lady Farnham, spoke at length with Bhai Sahib Ji and discussed the contribution that community organisations and the voluntary sector as a whole was making. Also representative from the Methodist Homes Charity found great synergy with the charitable work of the Nishkam family and spoke with Bhai Sahib Ji about their endeavours. Overall the event went really well and it was obvious that the guests enjoyed their time at St James’s Palace. It was an event to be remembered and everyone was pleased to have met The Queen who went out of her way to mingle with the guests over the drinks and canapés reception. It is incredible to see the Sikh community involved in society. Here in New York, we need something like this.